Remind-Me is calendar software that tracks and reminds you of important events before they occur. It displays holidays, birthdays, anniversaries, or any regularly scheduled event in a list or on an attractive traditional calendar. 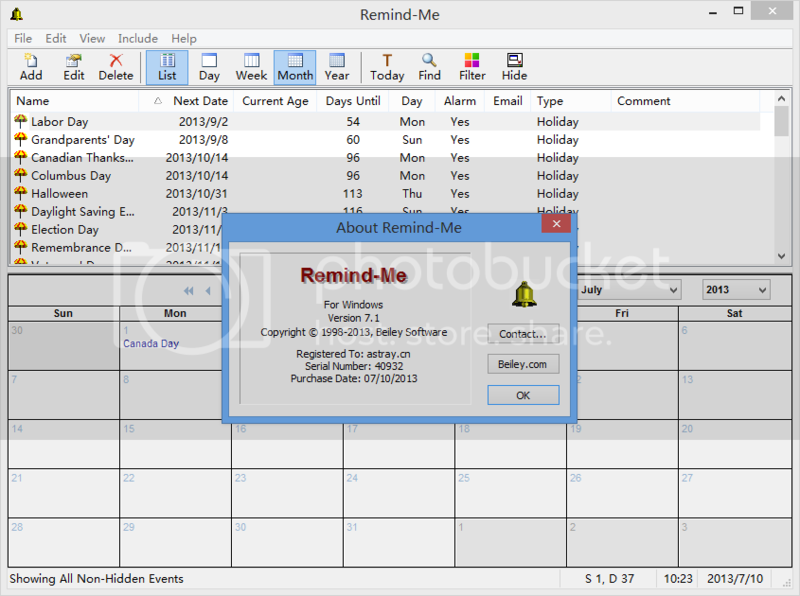 Have Remind-Me alert you of events when your computer starts up, or at any specified time. Remind-Me has built-in support for sending e-mail when an event comes up. E-mail can be sent automatically, or compose it yourself. Remind-Me can even attach a personal audio greeting, recorded by using your computer’s sound card and microphone. Remind-Me is also useful as a general purpose calendar, with built in support for all the major holidays. Customize Remind-Me to operate however you like. Have Remind-Me start when Windows starts or start up hidden in the task tray. Leave Remind-Me in the task tray to have quick access to a calendar filled with your events. The Remind-Me task tray icon also serves to show the current day of the month. Optional add-ons are available to synchronize Remind-Me with your smartphone or Outlook.